Declan is a New Frontiers alumnus and the co-founder of KudosHealth. The startup has developed an employee health engagement SaaS solution aimed at large employers. Declan sold his first business when he was 23 and has since worked with Bank of America in leadership roles as part of the bank’s future leadership development programme. 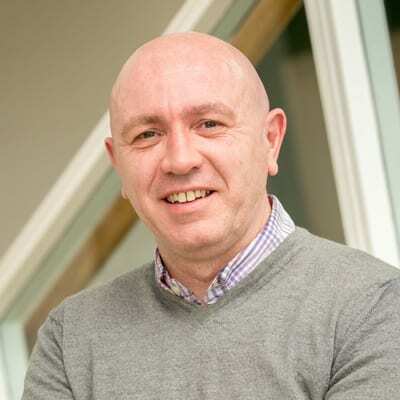 He has also worked in the marketing sector with a national marketing company based in the North-West. He considers himself a problem solver, who loves the challenge that being involved with a start-up business brings. Declan’s co-founder, Mario Gheghici, moved from Malta with his family to take up the position of Digital Marketing Manager in a Sligo-based company where Declan was Global Sales Manager. It was there that the two met in 2014. The business idea developed from discussions on how people are motivated to stay healthy, and how employers benefit as much from a person’s health status as they do themselves. The two decided that companies must be interested in motivating their workforce to stay healthy, and this led to discussions on what kind of health initiatives companies implement for their employees, and how they could be made better and more cost-effective. We used the programme to strengthen the business plan, explore various business, sales and marketing plans and learn how to implement them effectively. We had a solid basis for a business plan but we needed it to be pulled apart in a secure environment, which the programme allowed us to do, it also allowed our peers to provide some constructive feedback, and us to learn from their experiences, thoughts and ideas. KudosHealth allows the employer to engage employees 365 days a year by running competitive activity challenges and leagues. The employer is also able to get valuable data and insights anonymously to the health-related activities of the employee population across various dimensions such as their departments, locations, age demographic, gender and see comparisons to other companies with the system. People will always advise you, ‘it’s okay to make mistakes, as long as your learn from them.’ That’s true, but it’s even better if you can learn from other people mistakes. It’s more cost effective.